Employees at national estate agents Leaders have got their fundraising efforts for new charity partner Teenage Cancer Trust up and running with a special Red and Blue Day. 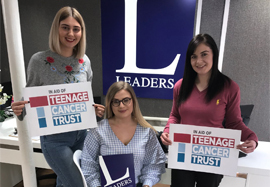 Leaders recently confirmed Teenage Cancer Trust as its charity partner for 2018 and has pledged to raise £50,000 for the good cause. It held its first major fundraiser of the year on Friday 2nd February to coincide with World Cancer Day, with staff from across its 123 branches dressing in red and blue – the colours of Teenage Cancer Trust – in exchange for a donation. There were also cake sales and competitions to raise further funds. Allison Thompson, managing director at Leaders, says: “We are proud to be working with Teenage Cancer Trust this year and it was fantastic to see all our staff show their support on Red and Blue Day, raising thousands of pounds in the process. “Teenage Cancer Trust operates 28 specialist cancer units around the UK offering expert care and treatment to young people aged between 13 and 24 who are diagnosed with the condition. Unfortunately, for every person the charity helps, there is another patient they are unable to reach, but with support from fundraisers they are determined to change this. With almost half of young people with cancer currently not treated in one of Teenage Cancer Trust’s units, the charity is in the process of implementing a new support service within the NHS to allow it to help all patients. Leaders previously supported Together for Short Lives and raised almost £150,000 for the children’s hospice charity in the three years to 2017 before announcing Teenage Cancer Trust as its new charity partner in January. For more information contact your local Leaders branch.